About the topic "Dilation transformation matrix"
"Dilation transformation matrix" is the matrix which can be used to make dilation transformation of a figure. Even though students can get this stuff on internet, they do not understand exactly what has been explained. To make the students to understand the stuff "Dilation transformation matrix", we have explained the rule using matrix which we apply to make dilation transformation of a figure. A dilation is a transformation that produces an image that is the same shape as the original, but is a different size. NOT an isometry. Forms similar figures. In simple words, dilation means, it just re sizes the given figure without rotating or anything else. Let A ( -2, 1), B (2, 4) and (4, 2) be the three vertices of a triangle. First we have to write the given vertices in matrix form as given below. If the given figure is dilated by the scale factor "k", then the dilation transformation matrix would be as given below. Dilation for " k = 2 "
Once students understand the above mentioned rule which they have to apply for dilation transformation, they can easily make dilation-transformation of a figure. For example, if we are going to make dilation transformation of the point (5, 3) for the scale factor " k = 2" , after transformation, the point would be (10, 6). Here the rule we have applied is (x, y) ------> ( kx, ky ). For k = 2, we get ( 5, 3 ) -------> ( 10, 6 ). Let us consider the following example to have better understanding of dilation. Let A ( -2, 1), B ( 2, 4) and (4 , 2) be the three vertices of a triangle. 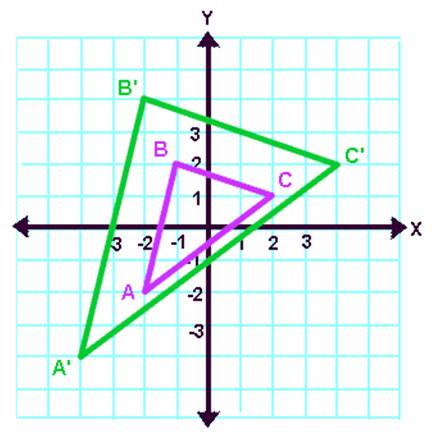 If this triangle is dilated by the scale factor " k = 2 ", what will be the new vertices A' , B' and C' ? First we have to write the vertices of the given triangle ABC in matrix form as given below. Here triangle is dilated by the scale factor "k = 2". So each element of the above matrix to be multiplied by 2. From the matrix in step 2, we can get the vertices of the dilated triangle for the scale factor k = 2. How to sketch the dilated figure? 1. First we have to plot the vertices of the pre-image. 3. When we plot these points on a graph paper, we will get the figure of the pre-image (original figure). 4. When we dilate the given figure for "k = 2 ", we have to apply the formula ( x , y ) --------> ( kx , ky ). 5. When we apply the formula, we will get the following vertices of the image (dilated figure). 7. When plot these points on the graph paper, we will get the figure of the image (dilated figure).